From a hands-on simulated labor and delivery to mock surgery, this year’s 11th annual NorthBay Nurse Camp again offered 30 teens an up-close and personal view of nursing. Four full days of activities and workshops were held in hospital settings—at NorthBay Medical Center in Fairfield and NorthBay VacaValley Hospital in Vacaville—coordinated and facilitated by a dedicated cadre of nurses, many of whom volunteer as nurse ambassadors at local schools. Meredith Oates, R.N., attended Nurse Camp in 2006, and earned her nursing degree from Point Loma Nazarene University in San Diego in 2010. She became a school nurse for El Dorado County in Placerville. She added a second job about a year later doing in-home/respite nursing for medically fragile children that she continues to do even now. In the summer of 2013, she left school nursing and began work at Shriners Hospital for Children in Sacramento where she works in their Transitional Care Unit. “I have enjoyed all my nursing jobs and am thankful for the role that Nurse Camp had in beginning my career,” Meredith says. NorthBay’s Nurse Camp had a positive impact and influenced my education and career choices. It was a wonderful experience. Jennifer Corbett, R.N., a Rodriquez High School graduate, attended Nurse Camp in 2006. She graduated from UC Davis with a bachelor’s degree in neurobiology, physiology and behavior. The following year she moved to Rochester, N.Y., and completed an accelerated program at the University of Rochester to obtain her bachelor’s in nursing. She is currently a nurse at Golisano Children’s Hospital on a pediatric unit, and working on her Master’s degree. 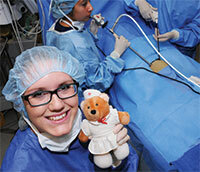 She plans to graduate in 2016 as a pediatric nurse practitioner. Jaclyn Nielson, R.N., an Armijo High School graduate, earned her bachelor’s in nursing this year from Brigham Young University. She attended Nurse Camp in 2008. She is now a nurse at Primary Children’s Hospital. “Nurse Camp was great in that it was the first time I was able to really get inside the hospital and experience what it actually looked like to be a nurse,” she says. Katy Stoltz, R.N., attended the first Nurse Camp in 2005 and went on to graduate from college in San Diego and take a job in the pediatric intensive care unit at Children’s Hospital in Los Angeles.